What do you need to know about doing business in Jersey City? Glad you asked. The first thing you should know is that you are a member of the CASID if your business is located in the Central Avenue commercial district. Secondly, the CASID is here to support your efforts to own and operate a successful Jersey City business. For your convenience, some important aspects of doing business in Jersey City are highlighted here on this webpage. Please be sure to explore all the resources provided below to learn more about doing business on Central Avenue and in Jersey City. We have you covered if you are an established storefront business in the Central Avenue shopping district or looking to become one. Information about day-to-day operation on Central Avenue (garbage collection, sidewalk maintenance, etc.) is available in our Municipal Laws to Know section and also on our FAQ page. Are you searching for a location to move your established or startup business and are not sure if Jersey City is right for you? Central Avenue and the Jersey City Heights is ready to welcome you home. Find available commercial space in the district and learn more about the neighborhood and the incentives to do business here. The Central Avenue business district is in the State of New Jersey Urban Enterprise Zone (UEZ) Program. What does that mean to businesses within the district? It means that businesses participating in the program can access a number of financial programs designed to stimulate job creation and business growth. It also allows certain businesses to charge half the sales tax on retail items. Municipal laws can vary from one local government to another. New entrepreneurs and seasoned business owners alike can save time, money and hassles by being familiar with the local laws that regulate businesses. We've saved you time by excerpting the sections of the code that are most relevant to doing business on Central Avenue and in Jersey City. Did you know there is a business curfew in effect for Central Avenue? 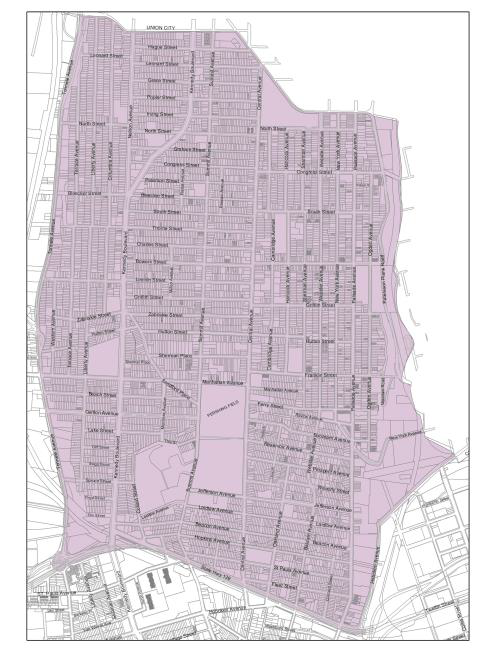 Learn more or refresh your knowledge as to how Jersey City regulates garbage collection, storefront signage, use of sidewalks, and distributing handbills (flyers, posters, etc). Your investment in Jersey City speaks volumes of the potential growth that exists here. This guide will assist you, the small business or building owner, to familiarize yourselves with, and thereby expediting, the process you'll need to follow to obtain the proper building permits which will lead to the City issuing a Certificate of Occupancy (CO). By clearly spelling out the steps necessary for State Code Compliance, it is our hope you will experience less confusion and avoid unnecessary delays. The City of Jersey City will guide you through the process of obtaining building permits and wants to make your process run as smoothly as possible. Small business keeps America in business. But while you have your shoulder to the wheel and nose to the grindstone, it can be tough to keep an eye out for scammers. That’s why the FTC and law enforcement partners across the country have your back. Parking Zone 16 encompasses all of The Heights neighborhood (Map). Any vehicles without Zone 16 permit parked in the zone over 4 hours (outside meter hours) may get towed. As of November 2018, zone parking enforcement will be 24 hours a day, 6 days a week (excluding Sundays). Permits are required (from Midnight Sunday through 11:59 pm Saturday night) for all residents and area workers parked in the zone over 4 hours. Permits for the new parking zone can be obtained online or at the Parking Enforcement Division Office, located at 394 Central Ave, Jersey City. Permit fees are established by City Ordinance 17-033. Non-Resident Work Permit (Heights/Zone 16 only) is $50 for 6 month period. For more information, visit the City of Jersey City website.